Practicing your golf swing in the winter requires determination and some creativity — if you live in a cold climate. Freezing temperatures and snow drifts make it hard to get outside to work on your chipping, putting and long shots. Despite that you should resist the urge to put your clubs away until spring. There are lots of drills and techniques you can work on to improve your swing even when it’s cold outside. Work on strength and flexibility during the winter. Golfers such as Tiger Woods and Phil Mickelson often use the offseason to improve their physical conditioning. That alone won’t improve your golf swing, but losing some weight and adding muscle can help you avoid injury and play better overall when the weather improves. PGA of America vice president Ted Bishop recommends at least 45 minutes of aerobic exercise four or five days a week. Following a fitness program designed by a personal trainer also helps, Bishop says. Find an indoor driving range to escape the cold. Practicing shots in a heated, domed facility is an option during winters in some cold weather areas. You won’t be able to hit your driver and fairway woods the full distance indoors, but some domed facilities are open late into the evening, allowing you to practice your golf swing at night if you work during the day. Find indoor ranges by asking fellow golfers or check with your club pro. Swing a weighted club in your garage if an indoor driving range isn’t an option. Weighted golf clubs are usually shorter than regular clubs, allowing you to swing them easily in your garage. The PGA of America recommends swinging a weighted club a few minutes every day to improve strength in your wrists and arms, and to increase your clubhead speed. Work on your grip indoors. Grip changes are one of the toughest changes to make. Winter is a perfect time to correct or tweak your grip. If necessary have a professional golf instructor show you a proper grip, or buy a club at your local golf store with a training grip attached. Keep the club inside your house during the winter and work on your grip several days a week. While watching TV, grip the club during each commercial and hold it until the commercial is over. Celebrity PGA teaching professional Michael Breed also recommends wrapping paper around the grip of a regular club. Practice holding the club with a grip so light that the paper doesn’t make a crinkling sound. Breed maintains that this teaches you to hold a club without tension in your hands and arms. Practice golf at courses that are open during the winter. Golfer’s flock to Phoenix, San Diego, and parts of Florida during the winter to make sure their game is still at a high level and even play tournaments when they are traveling. Even taking the time to get to a warm climate for a few days can be huge in order to get the feel of your swing, see the ball flight, and make sure the things you are working on are working out. Get outside into your backyard on a nice winter day if golf courses or driving ranges are not an option. Swing a golf club 100 times without hitting any balls. Practice each swing as if it were the real thing. Working on your strength and flexibility, your grip and taking 100 practice swings as many days as possible during the winter could be enough for significant improvement in your swing. Attend a golf camp. Golf camps provide great learning opportunities and another chance for you to get to a warmer climate and get outside and see the ball fly. Here at CGC we have plenty of winter golf camps with various college golf coaches that want to help you improve. Click here for the list. 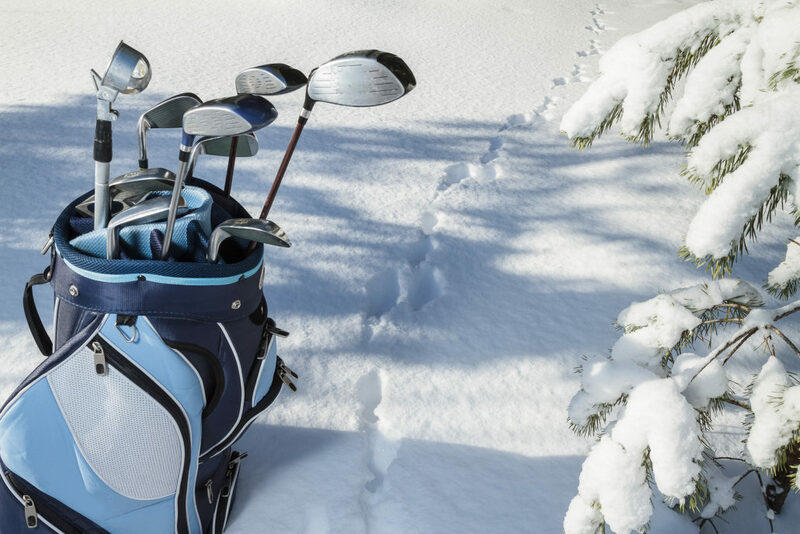 The key thing to remember during winter is that the best golfers don’t simply put the clubs away and forget about golf. For junior golfers who want to play college golf you must continue working on your swing, athleticism, and psychical condition. Reaching your goals doesn’t come without hard work. Lee, Robert. 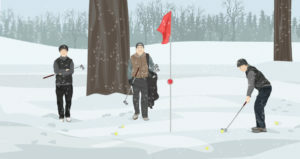 “How to Practice Your Golf Swing in Winter.” Golfsmith. Copyright 2016 Golfsmith International, Inc, n.d. Web. 25 Nov. 2016. 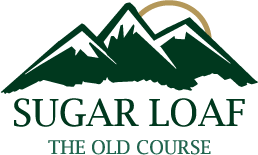 Golf News Advertise with Sugar Loaf in our 2019 Yardage Book Program!